4833 & 4501 stand at Kandos station having arrived from Sydney. Photo Jamie McIntyre. To celebrate 50 years of service of the trusty Goodwin Alco DL531 48 class locomotives, 3801 Limited operated a tour from Sydney to Kandos and return on Saturday February 2o headed by Goodwin Alco heritage locomotives 4833 & 4501. The occasion was a double celebration as 2010 marks 15 years of heritage activities by the Goodwin Alco Pty ltd team, and what better way to celebrate than to have both locomotives head the train west over the Blue mountains and through the Capertee Valley with a train full of passengers. To ensure everyone had the opportunity to record the occasion a line side photo stop was held under the towering bluffs at remote Brogans Creek before the passengers were treated to a magnificent lunch either on board or at the Kandos Hotel. Miles from civilisation the Goodwin Alco units run past for the photographers. Photo Leon Rudd. With the train remarshalled and the passengers back on board a glorious western afternoon ensured the scenery was seen at its best as the train retraced its path back to Sydney. Powering through Wallerawang 4501 leads 4833 and a train full of happy passengers on their way home. Photo Geoff Taylor. For information about future tours contact 3801 Ltd on 1300 65 3801 or visit http://www.3801limited.com.au/. After several months effort, hundreds of hours of voluntary labour and numerous litres of paint RailCorp Heritage Railmotor set 621/721 was returned to service by custodians The Rail Motor Society on Sunday 17th January 2010 again wearing its original livery. Whilst largely completed by Goodwin Alco the sets transformation is also due to the combined efforts of The Rail Motor Society and Maitland Rotary volunteers who worked with the project team resulting in a great example of inter group support and co-operation. The Rail Motor Society's team also carried out body repairs, a mechanical service and car cleaning and fit out to ensure all was ready for the inaugural trip to Nowra. Goodwin Alco took time off from restoring their own set 629/729 and both managed and sponsored the project by contributing paint, preparation materials, voluntary labour, project management, reproduction shaded lettering, and also reinstated original toilet mirrors and replica builders plates. 4833 visits the National capital! December is a busy time in many areas due to pre Christmas celebrations and Canberra is no exception. Every year the ARHS ACT division run an extensive program of pre christmas special trains to cater for end of year office party and group celebrations. The end of 2009 was no exception and to cater for the capacity crowds that booked on the dinner & dance special trains Goodwin Alco's 4833 was requested to head south to help shift the loads. Holding hands with ARHS's 50 year old Alco 4807 and Steam stalwart 3016, 4833 operated to destinations including Bungendore and Tarago with record crowds tugging behind on the drawbar. During its time in Canberra 4833 also got to rub couplers in loco with oldmates including ARHS's tuscan & russet painted 7315 and newly acquired mainliner 4468. Following the success of this initial visit future trips are being discussed and further examples of interworking and cooperation between the like minded oldmate groups is in the pipeline. 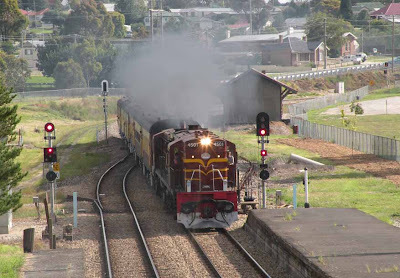 Thanks to Canberraite Paul Quinn for providing the "on shed"pics during 4833's ACT visit.